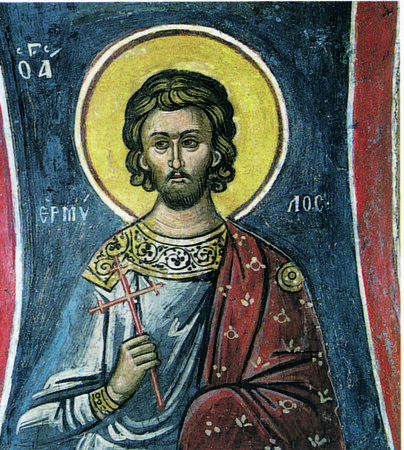 The Christianity has been spread in Scythia Minor, as Eusebius of Caesarea noted in his Ecclesiastical Story (3,1), through the preaching of Andrew the Apostle. This tradition came from Origenes (Commentary on Genesis 24,9, PG 12, 92). In any case, there are early mentions about the Christian life in this province, so that there are known the Martyrical Acts of Epictetus and Astion (died 290) and together with their martyrium there is also known that 14 days after their death Evangelicus, the first bishop of Tomis, came in Halmyris in order to baptize the parents of saint Astion. There is no more information about this bishop. Anyway, an inscription discovered in 1974 in Constanta (the modern city built on the ruins of Tomis) confirms the existence of a bishop named Titus or Philus during the persecution of Licinius (308-324) who might have died martyrically and who is commemorated on Jaunary 3. Another bishop named Gordian might have died also during the persecution of Licinius, around 324, together with Sts. Macrobius, Helias, Zoticus, Lucian and Valerian, being commemorated on September 13. In the Roman Martyrology, Gordian (named here as bishop) is commemorated together with Macrobius and Valerian on September 15. There is also an anonymous Scythian bishop who participated at the first ecumenical synod from Nicaea (325), as Eusebius writes (Life of Constantine III, 7). More information there is known about the next bishops of Tomis, Bretanion and Theotimus. Saint Bretanion of Tomis, also known as Brettanio, Bretanio or Vetranion is the fourth known bishop of the city at the shore of the Black Sea (the first being Evangelicus, 295-300), celebrated from the old times on January 25 (Acta Sanctorum Januarii, tom III, Paris 1873, p. 235). He was originally from Cappadocia, being born in a Christian family. There is unknown how he came to be bishop in Tomis, but he was already in his office in 369, when Valens (364-378) knew him personally during his way to Noviodunum, where the emperor closed an armistice with the Goths. Valens stopped in Tomis and visited the cathedral of the capital city of Scythia Minor, moment which he met the bishop and tried to impose to him the arian beliefs. The historian Sozomenos (Historia Ecclesiastica 6,21, Migne, PG 67, 1343-1345) tells about this episode: “It is said that … the Scythians adhered with firmness to their faith. There are in this country a great number of cities, villages, and fortresses. The metropolis is called Tomi; it is a large and populous city, and lies on the sea-shore to the left of one sailing to the sea, called the Euxine. According to an ancient custom which still prevails, all the churches of the whole country are under the sway of one bishop. Vetranio ruled over these churches at the period that the emperor visited Tomi. Valens repaired to the church, and strove, according to his usual custom, to gain over the bishop to the heresy of Arius; but this latter manfully opposed his arguments, and after a courageous defense of the Nicene doctrines, quitted the emperor and proceeded to another church, whither he was followed by the people. Almost the entire city had crowded to see the emperor, for they expected that something extraordinary would result from this interview with the bishop. Valens was extremely offended at being left alone in the church with his attendants, and in resentment, condemned Vetranio to banishment. Not long after, however, he recalled him, because, I believe, he apprehended an insurrection; for the Scythians were offended at the absence of their bishop. He well knew that the Scythians were a courageous nation, and that their country, by the position of its places, possessed many natural advantages which rendered it necessary to the Roman Empire, for it served as a barrier to ward off the barbarians. Thus was the intention of the ruler openly frustrated by Vetranio. The Scythians themselves testify that he was good in all other respects and eminent for the virtue of his life.” Theodoret of Cyrus tells the same story in his Historia Ecclesiastica (IV,35). The bishop might be the author of a letter knew as the martyrical act of Saint Sabbas (Sava) from Buzau, celebrated on April 372, who died as a martyr by the hand of the Goths in 372, in the region situated northern of Danube. 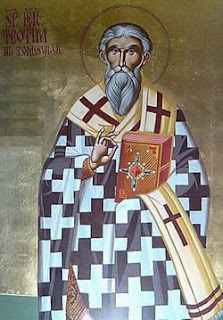 Saint Basil of Caesarea asked Iunius Soranus, the dux of Scythia Minor, for the relics of the Saint, which probably remained for a while in Tomis in their way to Cappadocia. Anyway there are some voices denying the possible tomitan paternity of this text, because it was written “from the will of the presbytery”, that means a college, which could be only situated in the northern territories: in all Scythia was only one bishop, as cited below. 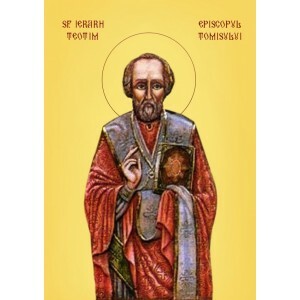 There is one more hypothesis that Bretanion would be the receiver of St. Basil’s thanking letters no. 164 and 165 for the transportation of these Relics, but the evidence (the mention of Ascholius from Thessaloniki) stays against such an hypothesis. 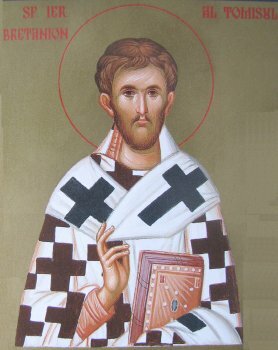 Saint Bretanion probably died on January 25, when he was celebrated and had as his successor the Bishop Gerontius, also known as Terentius or Terennius, who participated at the second Ecumenical Council from Constantinople (381). 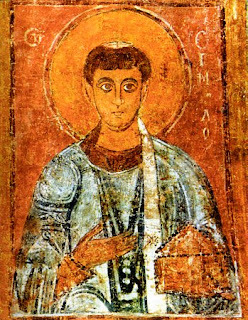 The byzantine synaxaries don’t mention about this saint, but the Roman Martyrology does, commemorating him on January 25. Today he is celebrated in the Romanian Orthodox Church at this date and there is a monastery dedicated to him in the village “23 August” near Constanţa. 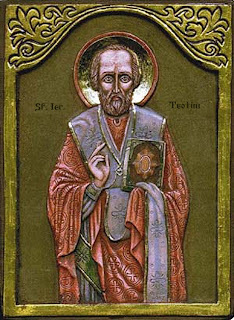 Another bishop of Tomis commemorated as saint is Theotimus, who was in office in the second half of the 4th century and the beginning of the next one, being contemporary to some of the Great Fathers such as St. John Chrysostom, St. Gregory of Nyssa, and St. Gregory of Nazianzus. There are no information about his birth and the place where he acknowledged his theological formation but, as contemporary of the locals St. John Cassian and St. Germanus, he might have lived together with them in the cave monasteries of the Cassians. As bishop of Tomis he was elected around 380-395 years after the death of his predecessor, Gerontius, though this fact is also a hypothesis. Among the Greek-speaking Writers, the historian Sozomenos called him „the Scythian Theotimus” which shows that he was a local. Later, Nicephorus Callistus, in the 14th century calls him as „man from Scythian nation and barbarian” (Hist. Eccl. XII, 45, Migne PG 146, col. 908). Description: Church historian Sozomenos makes a portrait of a great moral sensibility and literary beauty, and also featuring the work of missionary held among barbarian Huns. Here's what he wrote: “The church of Tomi, and indeed all the churches of Scythia, were at this period under the government of Theotimus, a Scythian. He had been brought up in the practice of philosophy; and his virtues had so won the admiration of the barbarian Huns, who dwelt on the banks of the Ister, that they called him the god of the Romans, for they had experience of divine deeds wrought by him. It is said that one day, when traveling toward the country of the barbarians, he perceived some of them advancing towards Tomi. His attendants burst forth into lamentations, and gave themselves up at once for lost; but he merely descended from horseback, and prayed. The consequence was that the barbarians passed by without seeing him, his attendants, or the horses from which they had dismounted. As these tribes frequently devastated Scythia by their predatory incursions, he tried to subdue the ferocity of their disposition by presenting them with food and gifts. One of the barbarians hence concluded that he was a man of wealth, and, determining to take him prisoner, leaned upon his shield, as was his custom when parleying with his enemies; the man raised up his right hand in order to throw a rope, which he firmly grasped, over the bishop, for he intended to drag him away to his own country; but in the attempt, his hand remained extended in the air, and the barbarian was not released from his terrible bonds until his companions had implored Theotimus to intercede with God in his behalf. It is said that Theotimus always retained the long hair (Kometes) which he wore when he first devoted himself to the practice of philosophy. He was very temperate, had no stated hours for his repasts, but ate and drank when compelled to do so by the calls of hunger and of thirst. I consider it to be the part of a philosopher to yield to the demands of these appetites from necessity, and not from the love of sensual gratification. "(Sozomenos, Hist. Eccl. 7,26, in Migne, PG 67, 1497-1500). This description makes us realize the missionary zeal and the gift of miracles that Theotimus had, but also the harsh circumstances of his mission at Tomis. 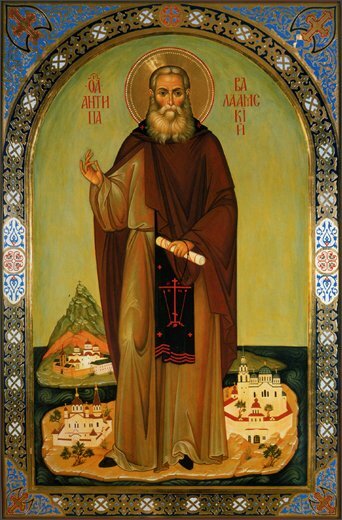 Saint Theotimus possessed and practiced the „monastic philosophy” and loved the „asceticism”, which in the Greek culture was associated with the philosophy. On the other hand, the term designating the long hair, „cometes” reminds about the „comati”, the title of which the noble Dacians (locals) were designated. During this period there are known some monasteries and hermitages in Scythia Minor, which were famous through their asceticism and who became in the 5th and 6th cnturies known throughout the empire because of the famous „Scythian monks” spread both in the regions situated between Danube and theCarpathians, and in Jerusalem, Constantinople, Rome and Africa. The ruins of their basilicas can be seen until today, being large and beautifully decorated with mosaics. This shows indirectly an impressive number of believers in the Scythian regions in these centuries. Emperor Arcadius of the Eastern Roman Empire have heard about Theotimus, because of his friendship with St. John Chrysostom. The archbishop of Constantinople sent in 399 some missionary monks „for the nomadic Scythians of the Ister”, probably being asked by Theotimus (Theodoret of Cyrus, Hist. Eccl. 5, 31). These nomads may be in fact the huns and there is supposed that the mission was successfub, because Jerome mentioned that „the Huns learn the Psalter and the coldness of Scythia is warmed by the heat of the faith” (Jerome, Letter 107). 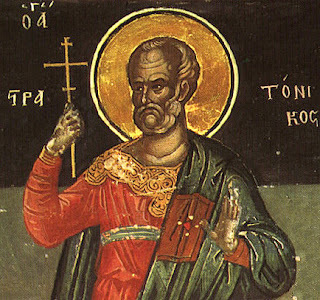 In 399 or 400, Theotimus took part in a local synod of Constantinople, convened by Saint John Chrysostomus against the bishop Antoninus of Ephesus who was condemned for heresy (Palladius of Helenopolis, Life of St. John Chrysostom, in Migne, PG 47, 179). He was very appreciated among other bishops, and this result from the fact that Theotimus is mentioned the first in the list of those who signed the documents of the council. 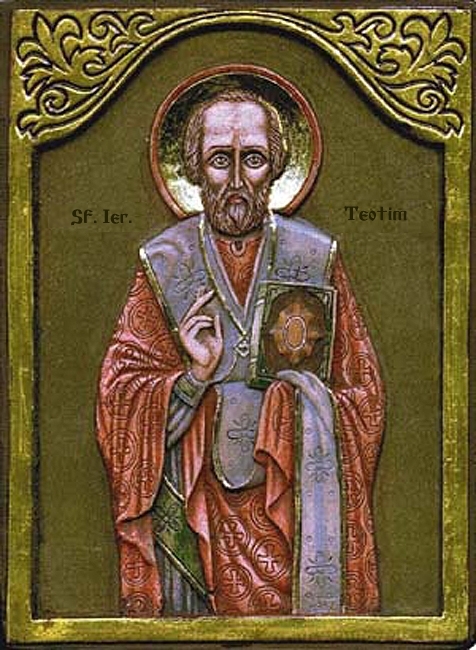 The saint died probably in the first years of the 5th century, after the Synod at the Oak held in July 403, where his friend, St. John Chrysostomus was condemned and deposed from his seat. 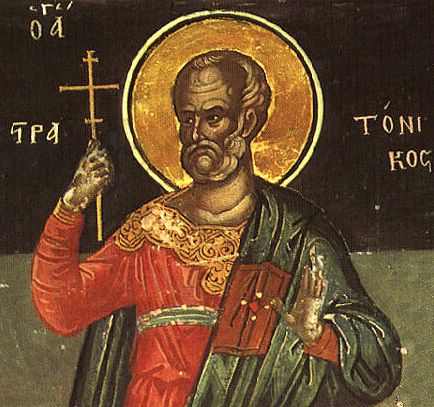 According to Acta Sanctorum (tom II/Xi, p. 753, Paris, 1866), St. Theotimus is commemorated on April 20 for „his holiness and his miracles”. Probably the date of the commemoration is the day he might have died. 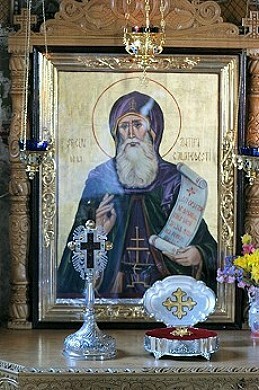 There is a monastery dedicated to St. Theotimus in Murfatlar, near Constanta. In the both cases of Sts. Bretanion and Theotimus there are no relics known to be held anywhere. 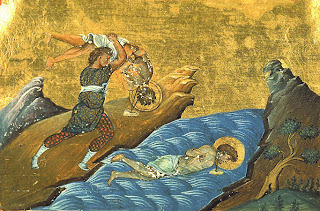 The Martyr Saints Ermil and Stratonicus, in Greek ῞Ερμυλος and Στρατόνικος, or in Serbian Свети мученици, Eрмил и Cтратонjк бэлгрaдски (Sts. 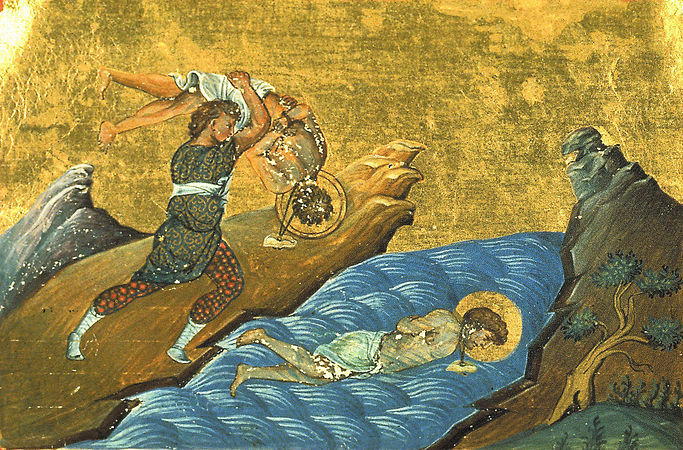 Martyrs Ermil and Stratonic of Belgrade) lived in 3rd – 4th centuries in the Roman province Illyricum, located on the middle course of the Danube, and received their martyrdom at Singidunum (the today Belgrade), being celebrated on January 13, their day of passage to the Lord. Their life and martyrdom are found in three variants, the earlier probably released in the late sixth century (according to a study published in the introduction to their lives in Analecta Bollandiana, vol 30, pp. 156 ff., and in Bibliotheca Hagiographica Graeca, N. 744 - 745b). Anyway the five manuscripts of this version are, perhaps from the 10th century. 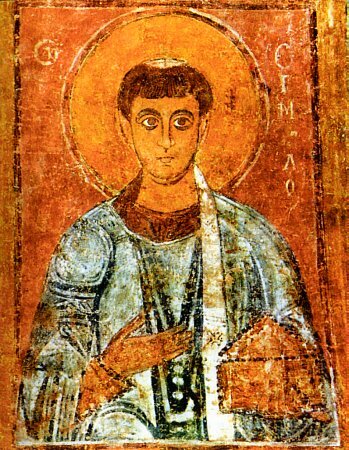 Another biography, which is the current used in the Orthodox churches was processed by Simeon Metaphrastes in his Vitae Sanctorum in the 9th century in Constantinople. It is found in volume 114 of JP Migne's Patrologia Graeca, cols. 554-566. A major study on the three different versions of the biography wrote F. Halkin in Trois textes grecs inédits sur les SS. Hermyle et Stratonice martyrs à Singidunum in Analecta Bollandiana vol 89, 1971, pp. 5-45. Today the Holy Martyrs Ermil and Stratonicus are the patron saints of the Serbian capital - Belgrade. The Museum of Belgrade celebrate Sts. 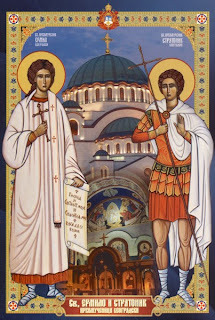 Ermil and Stratonicus as patrons of the institution and a paraklis (chapel) of the Cathedral of St. Sava in Belgrade) is dedicate to these Holy Martyrs. 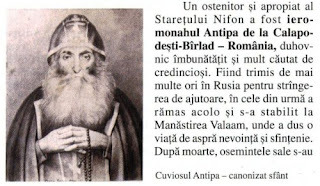 Saint Antipa, a monk who lived in the nineteenth century in Moldova, Mount Athos and Valaam Monastery in Russia, is known as „Antipa from Calapodeşti” in Romania, or „Antipa from Valaam” in Russia. His life he was written by Pimen, abbot of the Monastery of Valaam in northern Russia and a former disciple of the saint, and later included into the so-called "Paterikon (Book containing the lives of the fathers) of Valaam” . The abbot stated that the the parents of the saint were holy close to the church’s life. 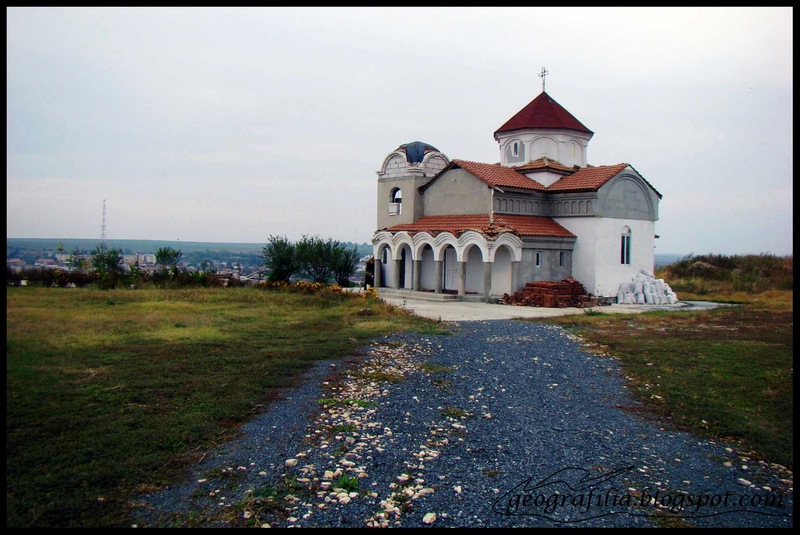 His father, George Constantin Luchian was a deacon at the church Calapodeşti - village, situated somewhere in the hills region between Bacau and Bârlad - and his mother, Ecaterina Manase later became nun Elizabeth. The couple had no children for a long time, but eventually, their prayers have been answered and God has given them a child in 1816, which they have christened as Alexander, the baptism ceremony being celebrated in the village church. In the writing about the monks from Valaam monastery saints there is told that the child Alexandru had had unusual powers, so that he got poisonous snakes in his hands and, to the surprise and horror of all, they haven’t done any harm to him. He taught at the village school book, and this time his father died, leaving him an orphan. To live, he had to learn the art of binding books to help support the family also. At the age of 20 years, "without warning he was overwhelmed with inexpressible and glorious light, which filled his heart with untold joy". Soon he left his family and went to Neamţ Monastery, one of the largest convents in Moldova, but he was not accepted by the abbot form here. He then went to a monastery in Wallachia; it seems to be Căldăruşani, where it was in high esteem the Athonite monastic order, imposed by Elder Paisie from Neamţ (1722-1794) and his apprentice, Gheorghe from Cernica (1730-1806). 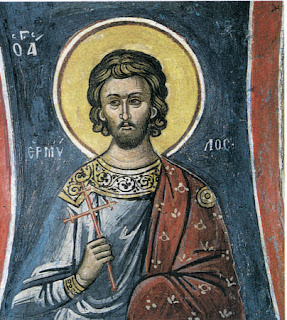 Here Alexander was accepted as a novice and later the abbot tonsured him, giving him the name Alipie (Alypios). At age of 20 he entered the monastery of Brazi, where he led a life of deprivation for two years. Soon he received a much respected charisma in the Eastern tradition, namely the "gift of tears". The hermit Gideon who has been living in seclusion already from 30 years, became his professor for the incessant practice of the "mental prayer" (also known as „Jesus Prayer”, containing the words: „Lord Jesus Christ, Son of God, have mercy on me, the sinner”). As a novice at Brazi, in 1842, he witnessed the discovery of the relics of Metropolitan Theodosius and wrote how that has happened (see the article about St. Teodosie from Brazi, celebrated on September 22). The saint remained at Brazi for two years and later went to the Holy Mountain of Athos, the "University” of the Eastern Monks. Hes stopped first near a cell of two Romanian monks near Lacu hermitage and later settled in Esphigmenou, where he served for four years in the kitchen. .During this period he received "great schema" of monasticism, which requires strict fasting, uninterrupted prayer and worship, being once more tonsured as "skimonachos (hermit monk, or in english „skemamonk”) Antipa”. Soon he was ordained deacon and then priest (that means, his title was now „hieroskemamonk”), living in an isolated cell. After about 20 years at Athos, in 1860, Antipa moved to the new hermitage called Prodromu, a Romanian skete founded by two Moldovan monks, Nifon and Nectarie, finished and consecrated in 1863. Antipa was asked to go to Moldova and raise aid for the completion of the building work, so he setteled for a while in Bucium Metoc from Iaşi, the capital city of Moldova (metoc, or in Greek, metokion, is a monastic dependency placed in a town under the jurisdiction of a monastery, which provides food and money for the monastery’s needs). First appointed for the administration and later as confessor of this dependency, his name comes to be known here, so many believers started to see him as a true example of humility, love and truly Christian living. His strict fasting (he would not eat for days on end), seriousness, zeal, love, kindness and humility (which he kept even in the midst of arguments which still happened) drew people to him. 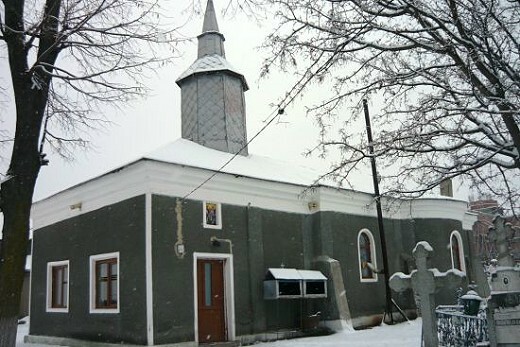 It is said that Metropolitan Sofronie (Miclescu) of Moldova particularly respected him and that that respect was mutual. Fr Nifon had the idea of going to Russia to get financial help for the skete, taking with him none other than the humble and wise Antipa. This is the way how Antipa went to Russia. He stopped in Kiev, in order to worship the relics of the saints from Pecerska Lavra, then went to Moscow, and finally to St. Petersburg, where he received many aids from various metropolitans, abbots of monasteries and another Christian believers. He was honored especially by Metropolitans Isidore of St Petersburg and Philaret of Moscow. They were themselves spiritual man, the second was canonized as a saint and is celebrated on 19 November. 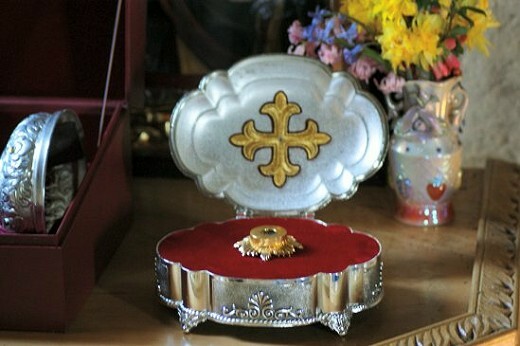 Antipa was found worthy to take part in the finding of other relics, namely those of St Tikhon of Zadonsk and invited to take part in the procession by Metropolitan Isidore in person. There is more to say that St. Antipa had a special piety for the Mother of God who, as the traditions state, showed to him and helped on many occasions and in special needs. 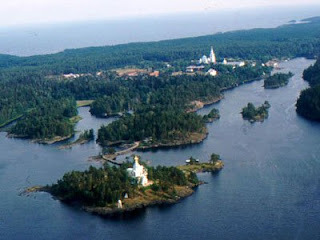 That happened once more when Antipa went to Valaam Monastery, situated on an island of Ladoga Lake, near Finland, which impressed him in a particular way. Wherefore, after sending the aids to Prodromu Hermitage in November 1865, he sat forever at Valaam, in cell from the hermitage dedicated to All Saints. He continued here his spiritual struggles, and tried to be useful in the congregation. He has come to receive the Holy Spirit's gifts of prophecy and vision in spirit. He was of exemplary asceticism. In his cell there was no bed or chair and he used just a rough blanket on the floor. He used not to taste or to drink anything on Mondays, Wednesdays and Fridays throughout the year, and in the first week of Lent, and for the other days it was enough for him the food he received Saturdays at noon. Due to his chosen life, he came to be known in the northern Russia and many monks and believers used to visit him for special services and sermons. Under his direction there were formed many disciples, who followed him into his spiritual path. After 17 years of this way of living, on January 10, 1882, aged 66 years, the Venerable Antipa passed away foreknowing three days earlier about that. After another sources, he would have suffered an apoplectic attack. He was buried in a crypt of the monastery of Valaam, near the chapel in honor of the Passion of Christ, where the pilgrims could easily come and celebrate his requiem. 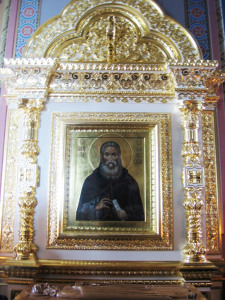 Being known and honored by all for his worthiness, the Abbot Pimen, one of his disciples, wrote and printed the saint’s life in 1883 in St. Petersburg, under the title: "The Life worthy of the memory of Venerable („ieroskimonah”) Antipa”. The book quickly spread and was printed again in 1893. 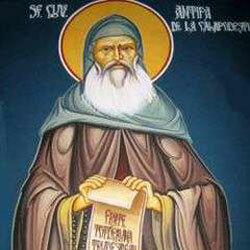 His fame as a saint was maintained both in Russia and Mount Athos, by those who knew him in life or from the book. 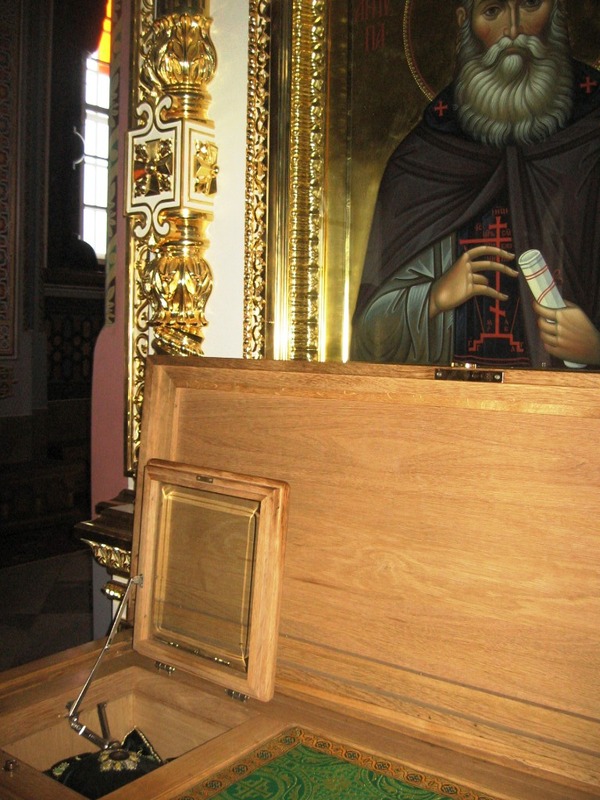 So that, in 1906 (24 years after his death) the Russian monks from the monastery of St. Panteleimon of Mount Athos (also known as Rusikon), wrote in Church Slavon his liturgical sevice into the Russian Menologion for January 10. It is therefore sanctification without a formal act of canonization, only by writing his name in the Menologion. Spiritual children who revered him would have unfettered access to his grave. In 1960, locals opened Elder Antipas’ grave with the intent of looting it. Signs of that disinterment remained over the years prior to the restoration of monastic life in Valaam. In May 14, 1991 the relics of the Venerable Antipa were uncovered, and were found to spread a strong myrrh scent. They were moved, after the memorial service, to the church of Sergius and Herman of Valaam, on September 24 (11) 1991, where there are until today. In Romania, the monk Antipa was until recently less known than in Russia. Therefore his name was wrote much later into the Romanian calendars, namely in 1992, being celebrated on January 10 (the day of his death, corresponding in the Russian Church Calendar with 23 January). In 1997 the local Christians founded a monastery at Calapodeşti, dedicated to All Saints Sunday (the first after Pentecost) and St. Antipa, who was born here. 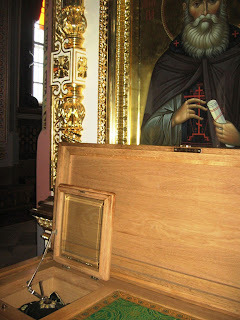 The Relics of Saint Antipa are at Valaam Monastery in Russia, as stated above, but small parts of relics can be found in other places such as Christiana Monastery in Bucharest, Suruceni monastery in Moldova (the right arm) and the monastery of Calapodeşti. You showed yourself as most wise adviser of monks and earthly angel, Holy Father Blessed Antipa, restraining your body with the passionless and illuminating the hearts of believers with the glow of your virtues. Therefore you have made yourself a honored place of the Holy Spirit, and in heaven you found God’s reward for your labors, whom ask to grant us great mercy! 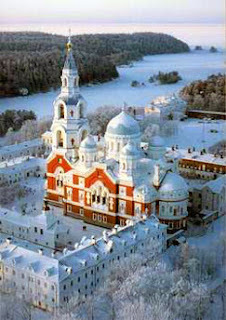 Arching over the earth like a rainbow, you got from the Holy Mountain Athos into the north, at Valaam. O Holy Father Antipa, much praised, you made yourself as the wonderful Old Men of Moldova, and now you are living in the heavenly glory of Valaam. Ask Christ our God to counsel us to the angelic life!